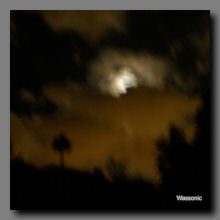 "Wassonic" is on sale for only $13.00CAN plus $3 shipping anywhere in the world! The self-titled debut from the new collaboration between Terrence O'Brien and Matthew Poulakakis. Regular readers of the ping things blog will know that I'm a big fan of both Anomalous Disturbances and Salvagesound. Both projects feature really talented musicians (Terry O'Brien and Matthew Polakakis respectively) who's artistry and humour shine through in all of their releases. So it should come as no surprise that I'm particularly pleased to hear that the two have collaborated as Wassonic to release an eponymous debut album. A collection of three long form tracks that cross a wide spectrum of styles, "Wassonic" is a great blend of the best musical qualities of both artists. "Factory Florist" opens the disc, building an expansive soundscape from rich pads and some interesting polyrhythmic percussion. As time passes sounds are subtly added to the flow, resulting in a wall of sound that shifts and evolves in an organic and natural way. Over the course of the track's length different tones pair up, spiraling around each other in the centre of the mix and then fading back into the soundscape to be replaced by new highlights. It's a beautiful piece, a really dense sound that surrounds and envelops. "Tree Frog Poison" has a darker sound to it, a sense of foreboding and danger that comes through a feeling of unresolved tension inherent in the track. A steady percussion creates an interesting oblique counterpoint to a steady drone that runs throughout the track, a number of elements floating through the soundfield creating a thick layering of sounds to explore. "Signalfish" closes the disc, and easily wins my vote as best track on the album. Found sounds and treated field recordings create an imaginary space that serves as a background for a lo-fi musical journey that flows slowly around my ears. It brings to mind a trip by rail, something reminiscent of a more subtle Underworld piece, the feeling of movement between spaces in a contained environment. It's a delicate track, something that hints at growing out of the space it's created but never really leaves. Over the course of its three tracks, O'Brien and Poulakakis do an excellent job of establishing a mood and a space for the listener, and also do a great job of presenting two of my favorite artists in a new and exciting way. "Wassonic" is a great collection of music by two tremendously talented artists, and I certainly hope that we'll be hearing more collaborative work from the two of them in the future.